The 140,000 Catholics expected to visit Australia next year for World Youth Day will have special visa privileges, officials said Friday. 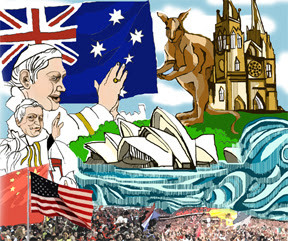 Sydney is hosting the July 15-20 event, and officials expect 500,000 people to gather for Pope Benedict XVI's first visit to Australia. Officials said there would be a 'tailor-made visa application system' that would allow people attending the event to stay for up to three months. All visitors to Australia need a visa, and prospective travellers from some countries are closely vetted before a visa is issued. An immigration spokesman said there would be no country limits on visas and no overall limits on visas for the event. Held every three years, World Youth Day was last hosted in 2005 in Cologne, Germany. World Youth Day organizer Cardinal George Pell has yet to finalize the venue where the papal mass will be held. The city centre Randwick Racecourse was the first choice of organizers, and the New South Wales state government had pledged to make the venue available. But the Australian Jockey Club (AJC) is adamant that the venue will not be released until compensation arrangements for the racing industry have been agreed. Organizers chose Randwick because of its central location and the availability of public transport.